And the Spicy Winners are…. I loved reading your comments posted on the blog! I have been running some amazing competitions and the latest winners are…Drum Roll please…. Hello !!! Love the new show and the quick and easy recipes. My favourite recipe is your eggless chocolate brownie recipe is fool proof. During our fasts I abstain from meat and meat products and i always have a problem finding egg free deserts. i have a sweet tooth so imagine my surprise when i was watching your show and had all the ingredients in my cupboard. We recorded the episode … And as I write this … The brownies are cooling yaay ! Thank you Congrats to Tania Joy Fredericks on winning the Blender!!! I love watching you cook. I always feel as if you are talking just too and I’m having a one-on-one lesson. Your recipes are easy to follow and delicious to eat. I am delighted and honoured to be featured in My Spar’s Savour Magazine! Did some say ‘Sinner Bun’? – World Baking Day. 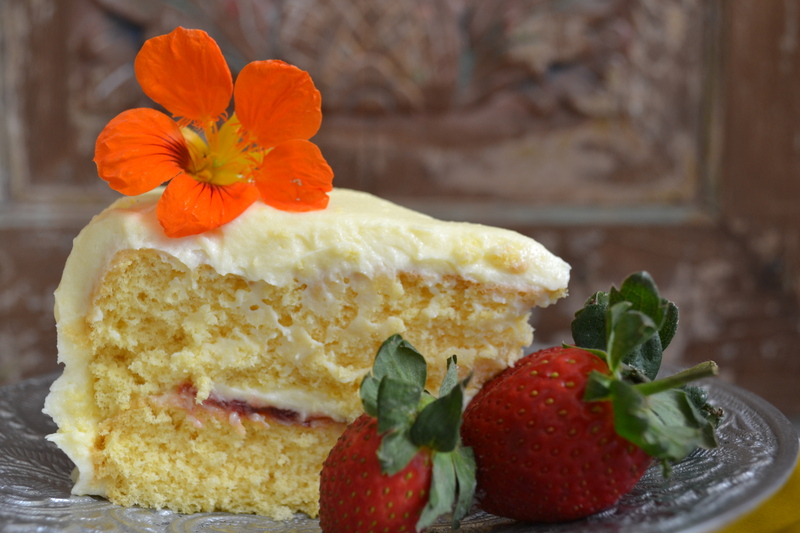 The 19 May will be celebrated as World Baking Day. So what will you be making to mark the day? 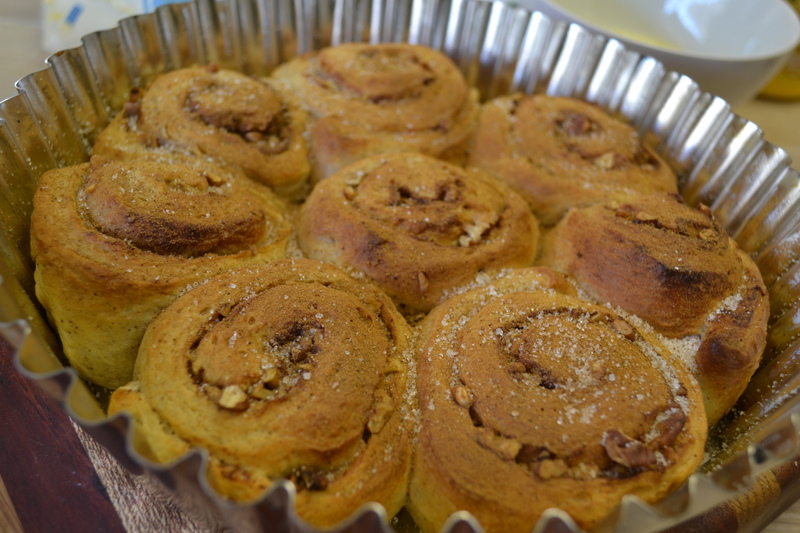 I have decided to spend some time teaching my kids how to bake some of their favourites and what could be better than a sticky cinnamon bun to start with. I call these Sinner Buns just because that is what they are! Smother the warm buns with lashings of silky soft frosting and they are orgasmic. These are best eaten fresh and warm – they do not keep well but then again they seldom last till the next day. They are not difficult to make but you do need one special ingredient…PATIENCE! It does take time and something as sinful as this should not be rushed. Place the warm water, fresh yeast and sugar in a bowl. Stir gently and leave in a warm place until it starts to bubble and froth. Stir in 100g of the measured cake flour and work into a soft dough. Leave the dough in a mixing bowl covered with cling film to double in size. Rub the butter into the remaining 100g of cake flour until it resembles bread crumbs. Stir in the salt and cinnamon. Add the dough and lightly beaten egg. Work the ingredients into a sticky dough until well combined. Cover the dough and leave to stand in a warm place for ten minutes. Press the dough down lightly every twenty minutes – do not overwork. Repeat this five times and then leave the dough to rise until it has doubled in size. Knead the dough lightly and place it on a work surface dusted with flour. Roll the dough into a 3 – 4mm rectangle, using your fingertips to flatten and shape it if necessary. Beat the egg with a pinch of salt and brush the surface of the dough. Finally the dough is getting some action! 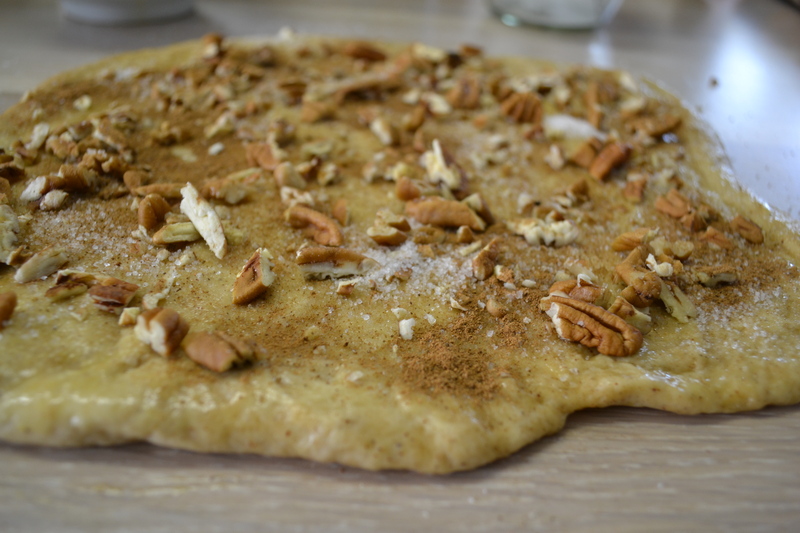 Sprinkle the cinnamon, sugar and pecan nuts over the dough. Roll up the dough into a log and cut into 8 slices. 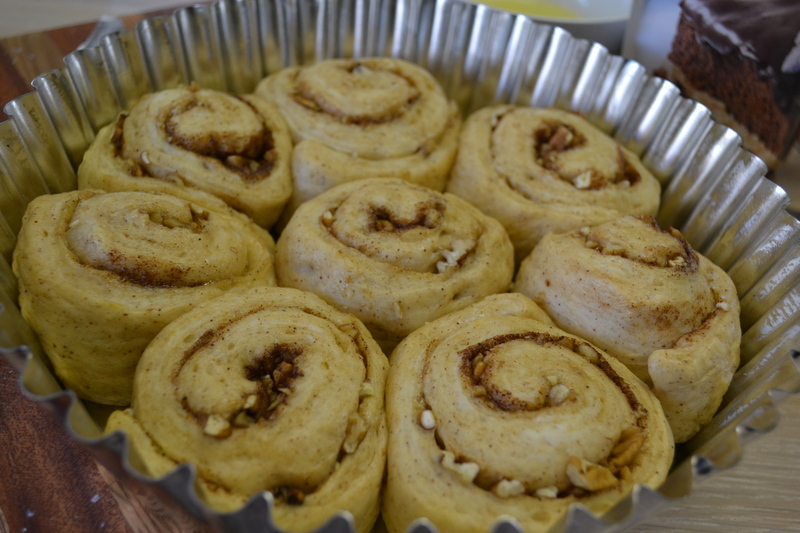 Place the slices in a 23cm greased loose bottom pie or cake tin with the cinnamon spirals facing up. Cover with plastic wrap and leave aside for an hour. Pre-heat the oven at 200 degrees celsius. Place a roasting tin and leave to pre-heat. Place the buns on the middle rack of the oven and lower the oven temperature to 180 degrees celsius. Pour 500ml boiling water onto the roasting pan which will release steam – shut the oven door immediately. Bake for 15 minutes or until the buns are golden brown. While the buns are in the oven, prepare the frosting. Beat the butter with icing sugar until pale. Add the cream cheese and continue beating until smooth. Lastly add the fresh cream and beat for a 10 seconds or until fluffy. Remove the buns from the oven and turn out onto a wire rack. Leave to cool slightly and spread the warm buns with the frosting. 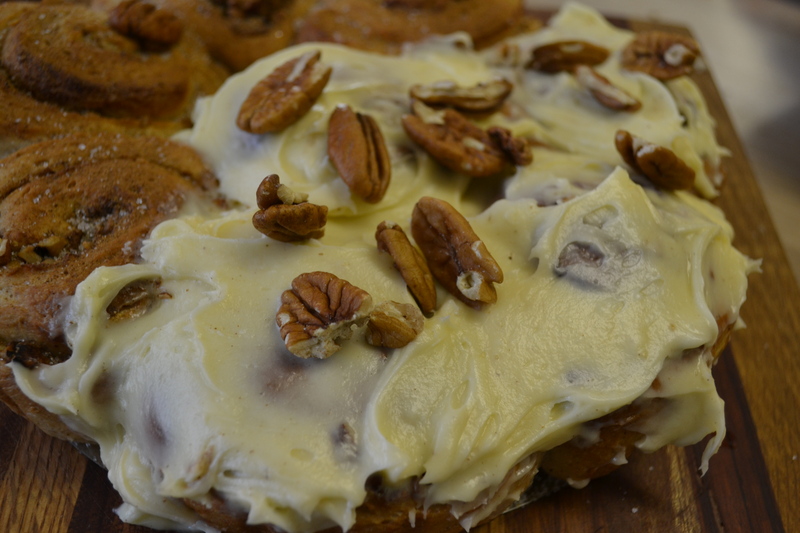 Garnish with pecan nuts and serve immediately. These are best eaten fresh and warm. The frosting may be left out if you prefer – brush the warm buns with a little melted butter and dust with sugar. 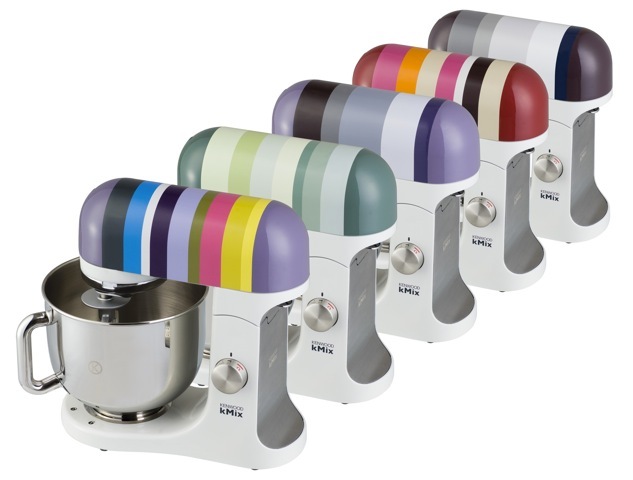 Celebrate World Baking Day with Kenwood! To celebrate World Baking Day, I have teamed up with the Independent on Saturday team and Kenwood! Get your copy of the Independent on Saturday tomorrow for competition details and four of my favourite bakes!!! Some of the recipes featured are Frosted Cinnamon Buns, Hazelnut Chocolate Cake, Custard Cream Cake and Raspberry Sponge!!! As the Winter chill starts to set in, the craving for deliciously spicy stews, casseroles and curries sets in. I love comfort food and this is one of my favourites. It is easy to make and does not require a list of exotic spices. 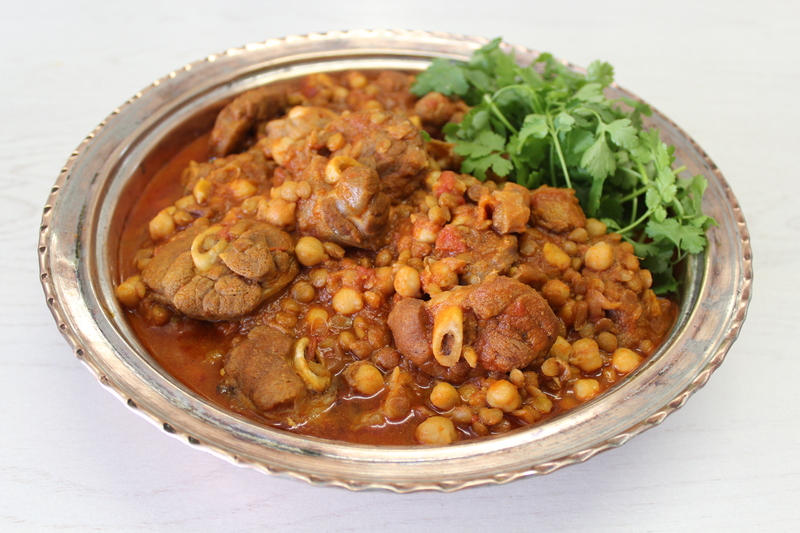 The Curry Me Home Magic Masala is a must must for this recipe! 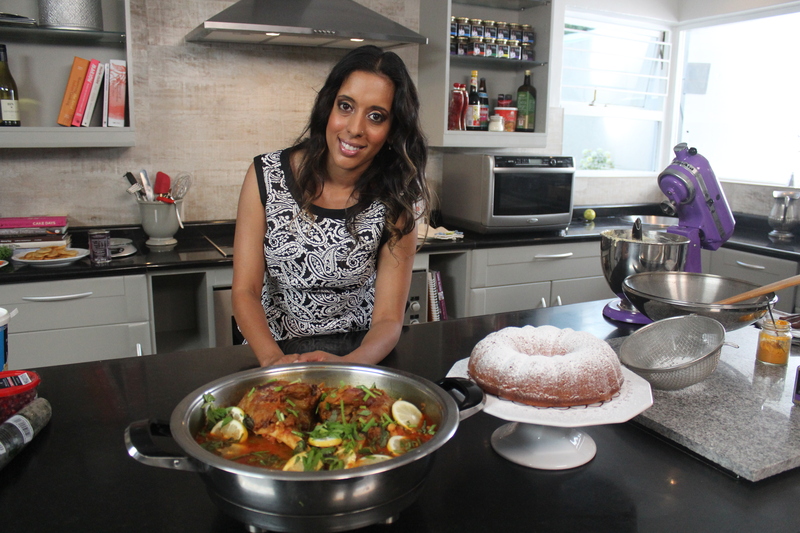 During the filming of Sugar ‘ n Spice, I prepared this dish with lamb shanks – for me, sometimes I prefer shanks and sometimes knuckles…it just depends on who is coming to dinner! I use the Spar tinned lentils and chickpeas – they are my standard store cupboard favourites. All I can say is that all tinned products are not created equal! Add the cinnamon stick, bay leaf and sauté until fragrant. Stir in the chopped onion and salt when the seeds begin to pop. Saute until the moisture evaporates and garlic is fragrant. Add the red chilli powder and stir for a few seconds. Add the lamb knuckles and then cover with boiling water. Simmer until the knuckles are tender. Once the tomatoes have softened, add the lentils and chickpeas. Add more water to thin out the sauce if necessary. Sprinkle the magic masala over and simmer for a minute. Garnish with fresh coriander and lemon slices. Curry Me Home spices are stocked in select Superspars around Gauteng. 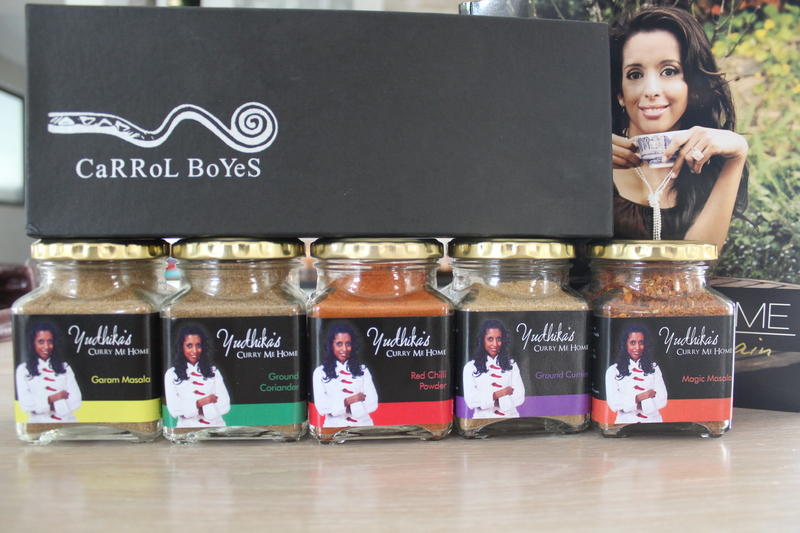 We also offer a mail order service – email me at hetals@iafrica.com for more details. There have been lots of requests for this recipe – I have posted it under the Sugar ‘n Spice recipe tab but here it is for easy reference! 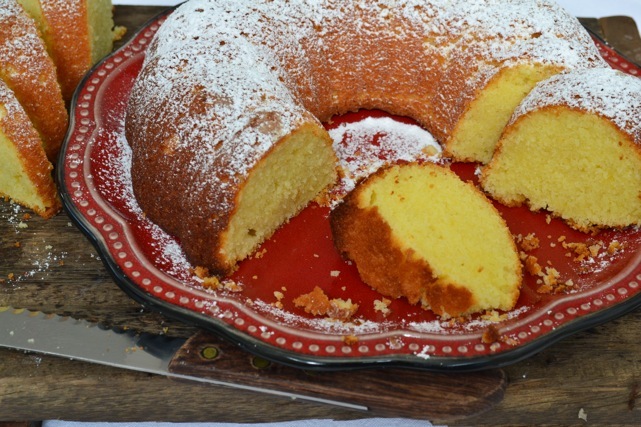 This cake is one of the most popular ones from the tv show and it is perfect for tea time – no cream or frosting required. Just dust the cake with a fine layer of icing sugar! It is an absolute treat. Don’t forget to enter the competitions that are still running – the Whirlpool microwave, AMC Paella pan and the KitchenAid blender are still up for grabs!!! Pre-heat oven to 180 degrees celsius. Grease a 20cm bundt tin with non stick spray. Place the egg whites in a metallic bowl and whisk with 30ml sugar until soft peaks form. Cream butter and add the sugar gradually. Continue beating the butter until the mixture is light and fluffy. Add the egg yolks one at a time with 2,5ml cake flour to prevent the mixture from curdling. Add the self-raising flour and the semolina and mix well. Pour in the yoghurt and beat well to combine. Add half the beaten egg whites and lightly fold into the cake mixture. Add the remaining whisked egg whites and lightly fold ensuring that the ingredients are well combined. Bake in a preheated oven for 35 – 40 minutes or until a skewer comes out clean when the cake is tested. Leave the cake to stand for 5 minutes before turning it out onto a wire rack. Dust the cake with icing sugar when cool. Almond or rose essence can be used to flavour the cake batter. All ingredients including the yoghurt must be at room temperature for the best results. If you do not have a Bundt tin, use a round baking tin but ensure that you line the base and side of the tin with baking paper. Orange zest can be used instead of lemon zest. 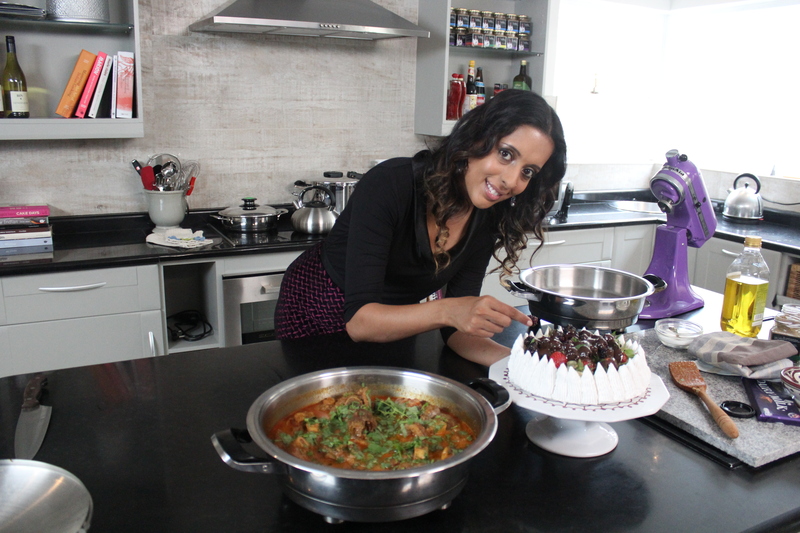 I think most of you have heard me ramble on about my first cooking show on Saffron TV. I talk about it often but then again, who wouldn’t? It’s been a big marker in my cooking career. 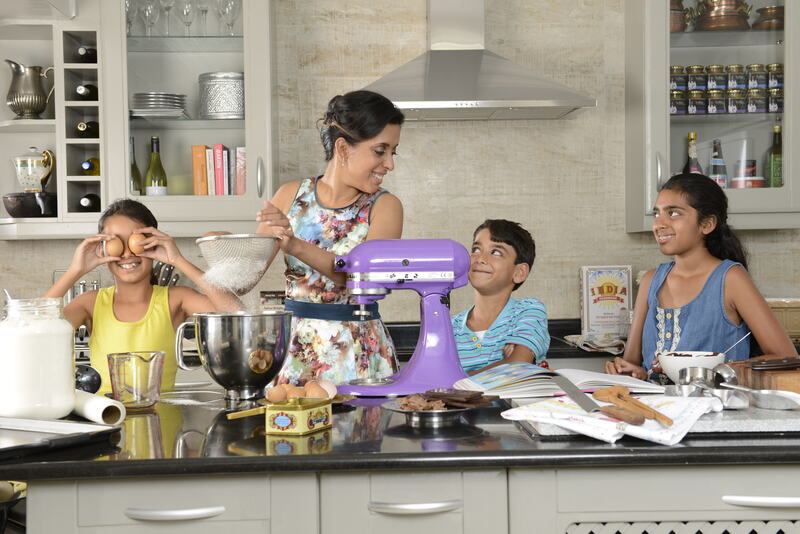 I received a mail from Ushi Goshalia, Saffron TV Channel Manager, a few weeks ago with the most surprising news….Sugar ‘n Spice will now be aired on The Home Channel! After the initial surprise, I am pleased – in fact, way more than pleased…delighted….no more than delighted…so while I mull over the right words to describe how I feel about my big move, I will share the details with you! Once again, I can’t thank my support team aka sponsors who have played such a big part in bringing the show to life! AMC cookware for every pot I could possibly imagine (small, medium, large and super king sized – nothing was struck off the list), My Spar for the ingredients (believe me, there was a long list), Jo Borkett for the lovely wardrobe and Whirlpool for the amazing kitchen appliances! A great big thank you to everyone who entered the My Spar competition! The winners are: Sarisha Rosenpershad, Carla Viana, Shainaaz Mullaji, Vanessa and Kiasha Chetty!!!! Congrats to all of you! Thanks for the easy Red Velvet cake recipe. OMG it tasted as if I had bought it from a bakery. Well with all da compliments from my Family I decided to use the same recipe but instead used blue food colouring to make Blue velvet cake for my nephew’s birthday. And Walla it was Awesome. Keep up the good work and keep all da mouth watering recipes flowing. All the ingredients you have used here in your Saffron TV: Spanish Style Chicken are in my pantry and fridge ! Now using your tang to this dish with a cinnamon stick creates a new twist sensation ! WOW You do our culinary Latin dishes so proud Yudhika, my Spanish mom and Portuguese dad also cooked up such a storms, to this day their style has remained part of my kitchen preparation and gathering over of family and friends. Thank You so much for carrying on the traditions of FAB home made cooking ! Cooking and baking was always not my strength however after viewing your recipes both my girls and myself are having fun in the kitchen . The messy choc cake was easy and delicious which left my daughter feeling like her mom is a masterchef . Great job , keep it up!!! !